Pluto is glad to inform you that 2016 is going to be an excellent year for Him, and that’s all you should care about. Pluto is extremely pleased with the three candidates to the presidency who have a chance to (formally) “lead” the USA. Instead of an obsequious servant from Kenya, once removed from little black boys conditioned to please wealthy white masters, anxious to please the powers that be, we are going for full bloodied plutocrats to “lead”, once again. Instead of an uneducated schmoozer from Arkansas, Pluto is happy to renew with unabashed lovers of the Dark Side, to lead you all, clueless, sport scores and celebrity obsessed losers! Remember when (Prescott) Bush and Hitler were friends? No, you don’t! Very good. “Wealth can be bad for your soul. That’s not just a hoary piece of folk wisdom; it’s a conclusion from serious social science, confirmed by statistical analysis and experiment. The affluent are, on average, less likely to exhibit empathy, less likely to respect norms and even laws, more likely to cheat, than those occupying lower rungs on the economic ladder. And it’s obvious, even if we don’t have statistical confirmation, that extreme wealth can do extreme spiritual damage. Take someone whose personality might have been merely disagreeable under normal circumstances, and give him the kind of wealth that lets him surround himself with sycophants and usually get whatever he wants. It’s not hard to see how he could become almost pathologically self-regarding and unconcerned with others. Well, we have a glaring example: the Roman Republic, which started to get a fatal disease, 22 centuries ago. We also have other, more subtle, examples of plutocracy killing civilization: several in China, at least one with the Baghdad Caliphate (which the Mongols and their Georgian, Armenians and Frankish Christian Allies killed, while asserting, loud and clear that the plutocracy had been the cause of the war, and the loss). Detailed examination of the collapse of American societies under the Conquistadores also showed that plutocracy played a major role: the Aztecs had the major military power, 200,000 soldiers, dwarfing the Castilan’s 2,000 soldiers. However, the Aztecs’ plutocracy was hated by all too many of the Natives (who provided Cortez with a 80,000 men army, at some crucial point). “Modern America is a society in which a growing share of income and wealth is concentrated in the hands of a small number of people, and these people have huge political influence — in the early stages of the 2016 presidential campaign, around half the contributions came from fewer than 200 wealthy families. The usual concern about this march toward oligarchy is that the interests and policy preferences of the very rich are quite different from those of the population at large, and that is surely the biggest problem. Krugman then gives explicit examples: “Sheldon Adelson, the Las Vegas gambling magnate. Mr. Adelson has been involved in some fairly complex court proceedings, which revolve around claims of misconduct in his operations in Macau, including links to organized crime and prostitution… What was surprising was his behavior in court, where he refused to answer routine questions and argued with the judge, Elizabeth Gonzales. That, as she rightly pointed out, isn’t something witnesses get to do. Krugman could have spoken about the countless billionaires friendly to Obama, and who became front and center in the society and economy of the USA. But he chose not to. That limits him tremendously. Krugman finally concludes: “Just to be clear, the biggest reason to oppose the power of money in politics is the way it lets the wealthy rig the system and distort policy priorities. And the biggest reason billionaires hate Mr. Obama is what he did to their taxes, not their feelings. The fact that some of those buying influence are also horrible people is secondary. Those who have so much power cannot justify it, except by saying, and first saying to themselves, that they are exceptionally good (and thus the others are relatively bad, as demonstrated by the fact that they are less able). This is why plutocrats call themselves “philanthropists”. Just as polar bears are white as snow, to hide the fact they exist, plutocrats claim their souls are innocent, and actually examples of all what’s best about humanity. Indeed, one of the attributes of Pluto was invisibility. Plutocrats also hide the obvious in plain sight. Through the media they control all over, they claim that the private moral system they use, founded, as it is, on greed and a high idea not just of themselves, but also of greed itself, should be the template of world morality. Thus Obama, following Nixon, made health “care” a profit center. Some more. It’s not just ethics which is affected. Intelligence itself also is, as the top decisions are taken only under the influence of a few brains (the brains of those who rule). Actually, the main interest of democracy is that, when The People (demos) rules, all minds rules, all ideas get debated, and all these debates create new ideas. When only a few brains are allowed to take part, much fewer ideas appear. Historically plutocratization has been the greatest enemy of civilization. The Roman Republic knew this, and came equipped with tough anti-wealth laws. Wealth above some limit was simply outlawed. However, the Second Punic war caused havoc; Hannibal roamed Italy for more than a decade, winning tremendous battles, and the Roman elite got killed on the battlefileds, while a new elite of greedsters acquired wealth (mostly by renting space inside fortifies cities which Hannibal could not take, to impoverished peasant refugees). After the war, in a few years, Rome lashed back at Hannibal’s allies, and carved a global empire. Globalization led to plutocratization: the wealthiest could escape Roman law by gathering wealth overseas. They quickly became so rich, they could pass laws friendly to extreme wealth. There was a civil war. The private armies of the wealthy killed those who wanted to crack down on plutocracy (notice that the anti-plutocratic leaders, the Gracchi were of the highest Roman nobilitas; still they were killed like dogs, in spite of tribunal immunity; at some point 5,000 of their supporters were assassinated in street fighting). This is how Rome went down. After that, efforts of various leaders of the Populares (Marius, and certainly Julius Caesar) were unable to reverse the power of the Senate (through which plutocracy organized society; the Senate lasted more than 12 centuries in Rome, dying sometimes around the late Seventh century, when the Franks took over). When a plutocracy rules, not only depravity reigns, but so does stupidity. 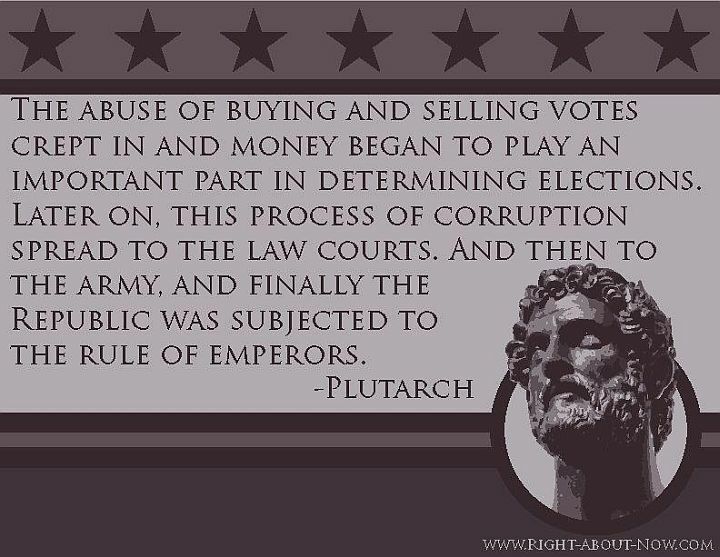 Thus as plutocracy overwhelmed Rome, the people was made stupid by the passions it was conditioned to have: “Paenem unde Circenses” (Bread and circuses), as Juvenal put it in 100 CE. The increasing stupidity of the fascist empire made it increasingly unable to take the right decisions not just financially or in economics, but also in education, health care, or even military matters. All the West is experiencing the same syndromes now. It’s not happening just in the USA. Plutocracy is global, legislation is local. We are at the stage where the plutocrats are imposing legislation friendly to them, through the Supreme Courts, or private tax systems. According to the charity Oxfam, in 2013, the 92 richest multibillionaires had as much wealth as the bottom 50 percent of world society. In 2014, this dropped to 80 billionaires. A bunch of individuals who can fit into a bus control more wealth than 3.5 billion people. Three and a half billion people is equivalent to the combined populations of China, India, the United States and the European Union. One has to realize that the influence of this 80 people gets leverage well beyond their wealth as all “elected” “representatives” are anxious to please them so they can prosper beyond their own, generally short, tenure in office. What’s life for? It depends if you are a master, or a slave, and whether you want to be a master, or a slave. Entire populations can be taught to love to be whipped into submission by princely plutocrats: just contemplate Saudi Arabia. And that state of sadomasochist metaphysics can last more than a millennium: contemplate the entire Middle East, which, for millennia prior, had been the world’s most advanced, a cradle of democracy, and the richest place we are still indebted to. But now it’s all gore, and Cult of Death. Verily, Pluto has much to thank for!